This is the star of the Sun Meadows complex! You won't find another this nice and this close to the slopes! Want to be near the slopes but everything "ski-in ski-out" is already booked? Then this is your condo! 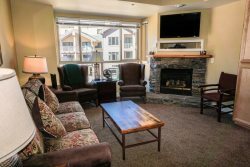 It is in the Sun Meadows complex which is right across the street from the slopes, practically ski-in ski-out, without all of the mountain noise. Step out of the condo and walk straight across the street to the slopes, very accessible for mid-day lunch. What makes this condo special is the updates the owners did. The living room has a massive wood burning fire place with new wood paneling behind it, creating an updated cabin look. The sectional is newer and very comfortable. The kitchen has granite counter tops and light wood cabinets. The kitchen/living room is completely open, making it a cozy place to bundle up after a day on the mountain. This home is a luxury two bedroom condo that features 1 queen in one bedroom and a queen and a twin bunk in the other bedroom while the living room has a sofa bed. "This is the perfect condo for a couple and a family or one big family. The location is key and the updates are perfect!" 2 Bedroom - Sleeps 8 - 1275 square feet. 2 Bathroom - We provide towels, soap, shampoo, conditioner and hairdryer. We provide the following amenities- dining table seating for 8, bar seating for 2, dishwasher, electric stove, microwave, coffee maker, basic pots and pans, brand new dishes and silverware. IHome for your phone and tablets. Really appreciated the flexibility by your team in helping accommodate a schedule change due to the fact that we had to attend a funeral at the last minute. Every time I talked with your team, they were very helpful, fun and just flat out nice to deal with. Really refreshing relative to other similar services. This is kirkwood specific - since this was our first trip up to kirkwood, at bit more warning about the fact that the food situation (e.g. grocery availability) is very limited up there. A reminder to stop at a grocery store and really stock up on the way up would have been nice. MANAGER RESPONSE: We are working on a better way to communicate that to new visitors.